Viator House of Hospitality quietly reached its second anniversary in January, but work supporting its young immigrant men seeking asylum, never stops. Br. 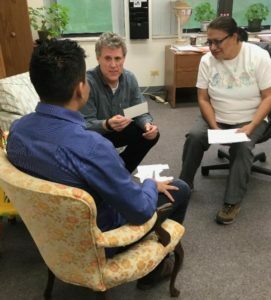 Michael Gosch, CSV, a social worker, and Sr. Rayo Cuaya Castillo, case manager, work with a young resident of Viator House of Hospitality. Now, word of the home and its mission is drawing increased attention. In the latest online edition of the National Catholic Reporter, Viator House of Hospitality is featured in a long article as an alternative to being placed in adult detention while awaiting their asylum hearings. The house currently serves as home to 23 young men from 10 countries, and they have a waiting list. Br. 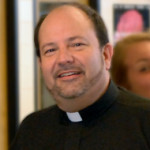 Michael Gosch, CSV, who directs the house with Fr. Corey Brost, CSV, says they hope to accept three more men in the coming weeks who are being released from adult detention. Getting residents to school, jobs and other activities continues — with the aid of volunteers — while staff members support them with case management and access to medical care, as well as language skills and meeting their spiritual and emotional needs. Fr. 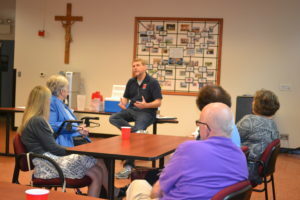 Corey Brost updates volunteers with Viator House for Hospitality. “The need is urgent,” Fr. Brost says. 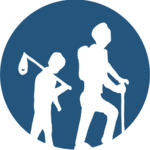 “According to the border patrol, there are nearly 60,000 unaccompanied minors crossing the border each year, or more than 200,000 who entered the United States between 2014-2017, without parents or adult guardians.